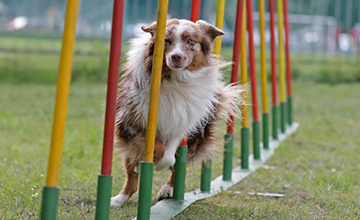 This is a great opportunity to practice your agility in a different atmosphere and have some FUN with your dog. There will be two courses to challenge all levels. Do all or part of the course and practice important handling skills, whether you are at the novice level or higher. Toys and treats are allowed. NO harsh methods will be accepted. Bring your chairs, crates and water bowl for your dog (we have a hose and water fountain). Please, only flat buckle collars. CRATING: Indoors in climate-controlled comfort (or outdoors if you prefer). EXPERIENCE: All levels (Novice class students and up if training at Lucky Dog) are welcome to practice this nested course (novice/open and excellent). After everyone runs the first course we will reverse it and run again after walking the new course. The lighting and footing are great. Toys and treats are welcome and encouraged to reward your dog. Everyone with a trained agility dog is welcome! 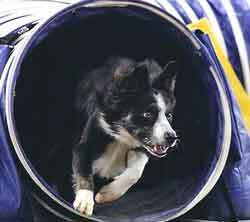 For currently registered Lucky Dog agility students and members: $5.00 per dog. All others: $10.00 for the first dog and $8.00 for each additional. *You need to be in an agility class, or registered for a class, and paid up on the date of the scheduled Fun Run. Members need to be current on fees as well. REGISTRATION: To sign up, click here. You must sign up in advance. CANCELLATION: Please let us know if you need to cancel. Space is limited. Thanks for your understanding and consideration. Email if you are interested in being on our Fun Run emailing list or if you have any questions.